Once upon a time, ninety nine years ago, there was a young man who lived in our house. His name was Carl Goodrich and his story fell into my lap–along with an old newspaper clipping—just a few days before we moved into a big old farmhouse on Lindbergh Avenue in the LaSalle section of Niagara Falls. As a genealogist, I was excited about the possibilities of the lives of those who came before us but I must admit that I was unprepared for Carl Goodrich…. Of course, when you buy an old house everyone wonders if you have ghosts—especially if the past residents experienced violent or tragic deaths. I have wondered about that myself but so far haven’t noticed anything out of the ordinary. The doors swing open by themselves…but old house doors do that. There are strange creaking noises…but old houses do that. And the cats stare into the nothingness—but cats do that. In my mind there are always those who came before us. Where can they possibly go? And who are we to think we are the only ones? Maybe people never really ever go away once they have carved out a comfortable spot. Maybe there are ghosts and we should learn all that we can about them and figure out how to live in some sort of harmony with all of our layers of history. So, like a good genealogist, I searched through old newspapers, directories and ancestry.com. I talked with the excellent LaSalle historians, Terry Lasher and Elaine Timm. They provided me with maps of old LaSalle and Elaine even found a postcard that not only included a picture of my house, but was scribbled on by a woman, a school teacher, who marked an “x” on the room that she was boarding at in my house. At the closing, even as it was getting later and later and the time was getting away from us, I asked the lawyer if I could just glance quickly through the search…to see if I was correct in my investigation. And there in black and white were the families who lived in our house (before the woman we purchased it from): the Greiner and Goodrich families, the Campbell’s, and the Hill’s. It’s not a long and complicated lineage at all. This house is the kind of house that people live in for decades. The white house to the left is Carl’s home. So after the pandemonium of the move, I decided I would focus on Carl Goodrich. His story struck me hard and it was July, after all, the month the terrible event occurred. I have in my possession a photograph of our Mr. Goodrich. As I hold the picture in my hands and try to imagine who he was I realize that there is no doubt he was handsome. He and nine of his friends are posing on a summer’s day on the dock at Crystal Beach; the old “American” excursion steamer, a popular Lake Erie pleasure craft in the background. 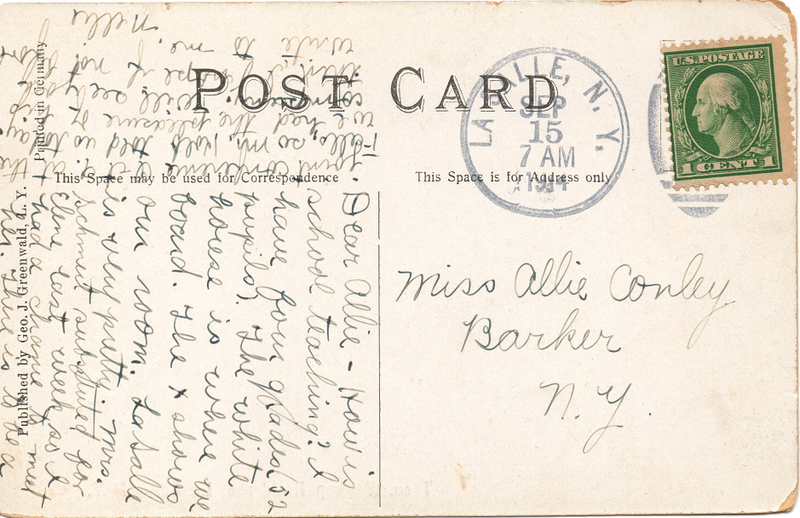 It’s July 2, 1913. He is wearing a playful little sailor’s cap on his head and casual summer clothing, sleeves rolled up. He is the only one smiling into the camera as if to say: hurry up there! I have places to be! Little did he know there was no hurry. Death was coming at full speed. He and four of the other boys would drown about an hour after this photograph was taken. His mother, Carrie, and his father, Mortimer, his grandfather, Karl…they were probably at home, at my home, sitting on the porch on a clear July evening. Drinking lemonade and beer. Waving to their friends as they passed by. Wishing them all a Happy Fourth. Picnics and fireworks on their minds. I look into the faded lines of the face in the photograph and I am mesmerized by his eyes; wondering if the mirrors, the windows in our house, have captured his eyes and if they are still here somewhere. Carl’s death adventure began on the holiday weekend. A crowd of friends had sent the Niagara Falls Canoe Club off on its maiden voyage across the river to Chippewa, up the Welland River to the canal, to Lake Erie and into Crystal Beach. They stayed at Crystal Beach for awhile and then it was time to venture back out toward home. The weather seemed fine as they headed into the Lake but the severity of the scene was deceptive. As they rounded Wind Mill Point, toward the mouth of the Niagara, they began to encounter rough waters. Since they were all expert canoe men and excellent swimmers they were confident of their ability to weather the storm. But one after the other the canoes were overturned. The crew members held on as long as possible. Carl, who was in a canoe with George Gray, held on as long as he could withstand—for over an hour. The waves crashed against him and drained him of all vigor. Eventually he was overcome with cramps and there was no hope. He was gone. It was said by one of the survivors that he may not have perished had he not stopped and turned around to attempt to aid another canoe man in trouble. Everything had gone terribly awry. Although missing for quite some time, Carl’s body and those of four of the other men in the photograph eventually washed upon the shore several days later. It was considered one of the worst tragedies in Niagara Falls history. Five of Niagara’s finest young men were taken by the River. Twenty year old Carl, while working at the Powerhouse of the Niagara Gas and Electric Light Company at LaSalle, was accidentally electrocuted after receiving 12,000 volts of electric current through his body– well over the amount necessary to normally kill a person. The Niagara Gazette explained that the average voltage used to execute a prisoner at Sing Sing was between 1,500 and 2,000 volts. The fact that Goodrich survived was a truly phenomenal event. Electrical experts insisted that “just as too large a dose of poison frequently acted as an emetic so a very strong electrical shock would tend to save the life of the person who would be instantly killed by a shock of one tenth the force.” When his fellow employees saw the flash and his body violently thrown to the corner of the room they ran to his assistance but found him unconscious. They attempted to resuscitate him. “For some time the young man’s life was despaired of” but after about fifteen minutes of resuscitation he began to show signs of life. The “remarkableness” of Carl’s escape from death was noted in papers across the nation. The young man, who lived in my home, had come back from the dead. But, of course, Death came back with a vengeance. Death doesn’t like to lose. Ever. I have begun to dig deeper into the story of our dashing Carl Goodrich. He may have been born in Naples, New York, on June 9, 1892. 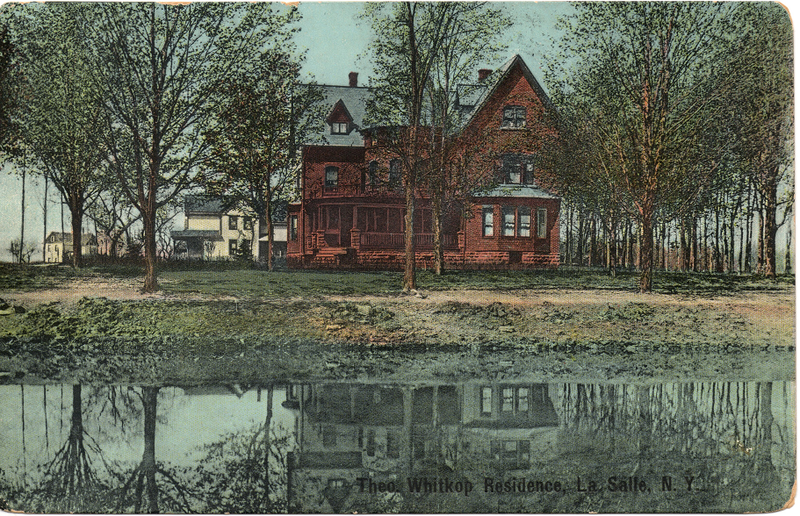 His parents, Mortimer Goodrich and Carrie Greiner, moved to the freshly built house on Pearwood Avenue in LaSalle, New York, around 1909. Pearwood Avenue is the present Lindbergh Avenue. They lived with Carrie’s father, a kind hearted German, also from Naples, who had been a stowaway on a ship to America as teenager. Karl Gotthold Greiner kept one of the most prominent aviaries in Western New York. It was said that over 12 tons of honey were prepared from his bee farm—at our home. I wonder if Carl ever wandered into the aviaries, curious about the bees and his grandfather’s careful work. I wonder if he had been stung and what remedies they had. And I wonder if the bees that ramble through our unkempt gardens could be descendants of those original bees. As I sit at my desk, right now pondering the life of Carl Goodrich–on July 2, 2012– I notice that our old clock has chimed seven times. On July 2, 1913, at a few minutes before 7:00, at this very moment ninety nine years ago, Carl took his last breath. 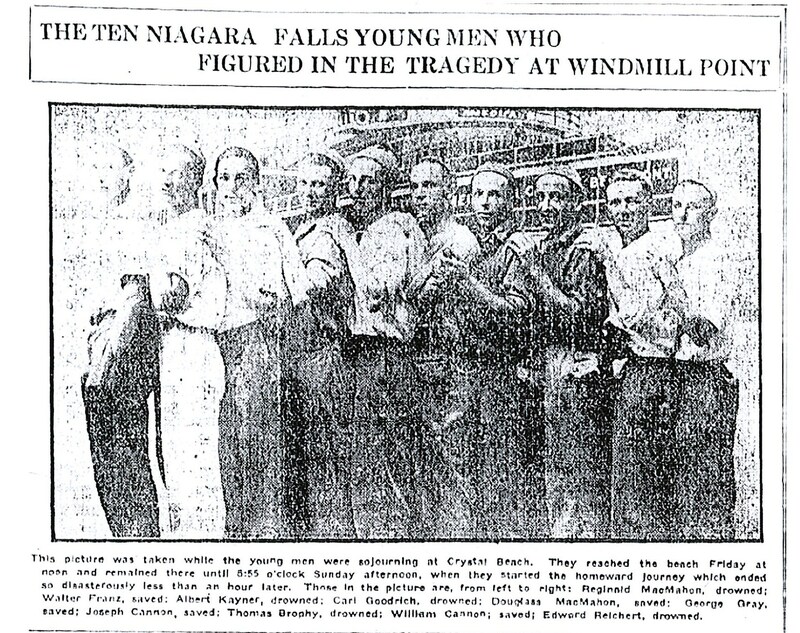 After he was laid out in his home (our home) and buried, the Niagara Gazette stated that “one of the last chapters of one of the worst tragedies in the history of this city was brought to a close.” There were five men from Niagara Falls who died that fateful day. There were five who survived the tragic event. Of course, they are all long gone now and most likely forgotten. But why? Maybe the lives before us are just as important as those who walk among us today. Maybe it’s time for a resurrection of the dead of Niagara. With the research tools we now have at our fingertips, people like Carl can come back to life. Sure, a young man left through the doors of my house one July morning, a suitcase and swim trunks…but that doesn’t mean that he will never return. ____________________________________________________________________________________ If you are interested in finding the history of your home in the Niagara area, let me know. With the information from your search, it may be possible to find the stories of those who came before you. Visit the Jon F. Popkey Genealogy Room at the Lewiston Public Library for details.